After releasing the post of +200 Google ranking factors, I am fully aware that the most important thing before starting an SEO campaign is you have to understand clearly SEO Process. Because you will not be able to set specific plans for the campaign without it. Even sometimes you may give meaningless steps. That is the reason why I decided to cover the topic of “SEO Process” in the article today. 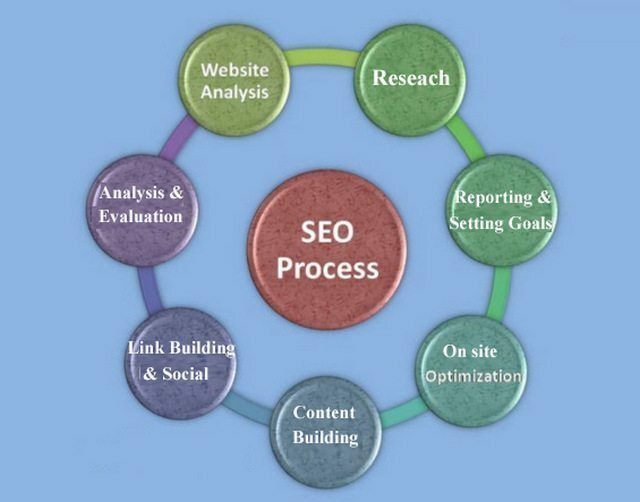 The first job of a SEOer to start is website analysis because it helps you gather data of the site such as current traffic volume, current ranking, best landing pages… Additionally, with this step, you will be able to evaluate your competitors about aspects such as target keywords, backlinks, .etc. Keyword research is a very important step in SEO because no keywords mean no SEO. It is not an exaggeration to say that: keyword is the orientation for your SEO campaign. Keyword research helps you know correctly terms, phrases, keywords that users enter into search tools to find relevant information on a specific field. Besides, you also will know good raking keywords on the result pages. Once appropriate keywords for your field are found, you can extend to find similar keywords. There are many tools to do this work, however, people tend to use the Keyword Planner which gives you similar keywords and monthly search volume. Should you choose keywords with high monthly search volume? The answer is no because it is difficult for you to get high ranking with those. You should find a set of 10 keywords for each field. The more detail information will be described in the next article of WordPress SEO Tutorial series. There is a famous sentence: “He who sees through life and death will meet with most success”. Social Network: With the strong growth of social networking, there will be no reason for a company not to use social channels for marketing. Besides, this is also a good way for you to know what customers think about products and services of competitors. Then, let like the page or follow your competitors to get the latest information from them to improve your plan. Ask directly your customer: this is a great idea. Make a registration form for new users to learn about products they used, how did they satisfy? Of course, when you lose a customer, you should also have a form to find out why have they left? And then, you can complete information about the competition and raise new ideas for your campaign. Participating in conferences and forums: by logging into them, you will be able to know who are your competitors? What do they have? and How do they interact with customers? After finding keywords and making an analysis about competitors, an accurate report about the targeting keywords, monthly traffic, estimate, strengths and weaknesses of the competitors should be made so that you can establish & improve SEO plans and goals. However, please note that these goals should always be accompanied with specific business purposes. All of them will be clearly stated in the next post of this series, then wait to see the latest information. A link to your website is considered as a vote and it is better to get a link from a reputable site like .gov, .edu and the same field which helps increase the ranking for your site. You should also note that association with spam sites is a minus point and make sure to use regularly link checkers to clean your site. Surely you have known about the power of online sharing on social networks. It will take your business to go further, to reach more potential customers and consult with customers. After performing the steps above, another report so-called as post-optimization report should be made to compare rankings, website traffic, social networking and other important data. The specific data will be used for an SEO plan depending on the goals of the website.